The world of technology is constantly changing, developing and bringing new challenges. We stay on top of it to bring original ideas and find the most effective solutions for your project. We are the best tech company of 2017! We are the best technological company in Czech Republic! We are proud to have received the title of EY Technological Entrepreneur of the Year 2017. 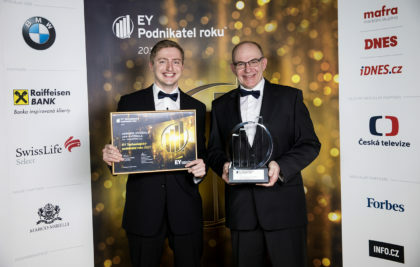 The Entrepreneur Of The Year program, founded by EY, has recognized the endeavors of exceptional business owners who create the products and services that keep our worldwide economy moving forward. The award is given out in 145 cities and more than 60 countries worldwide. Watch the EY nomination video to learn more about us.